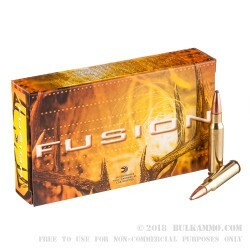 Never let your big game quarry escape again with these premium rifle rounds from Federal. 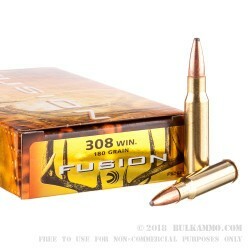 These .308 Winchester rounds from the Fusion line use unique bonded bullets that won't separate after entering a target; this ensures that the bullet stays whole as it expands, delivering a wonderful amount of game-dropping energy and shock to the internal organs for a quick and humane stop. The soft point bonded projectile weighs in at 180 grounds for long-range energy retention and has a nice toothed cannelure at its center where it is crimped into its reloadable brass casing. This arrangement preserves accuracy by keeping the bullet from slipping under recoil or rough handling. The brass casing itself is reloadable and home to clean-burning powder and a non-corrossive Boxer primer. Federal treats the primer's edge with sealant that prevents moisture from penetrating the case and ruining the round. Federal Premium has been in the ammunition business for just under a century and is a trusted name in hunting communities, law enforcement offices, and competitive shooting circles due to their strigent quality control and high degree of ammo quality. 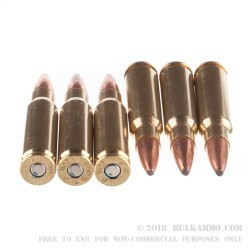 A: This ammo is loaded with a spitzer style, boat tail projectile. This will give greater accuracy and range than a standard flat base projectile.